For model-year 2011, Polaris kicked down the front door and tossed a flash-bang into the kitchen. After the surprise shock from the noise, light and smoke, a new RMK stood poised at the front door. Years ago, when Polaris showed off its Vertical Escape in McCall, Idaho at Photo Shoot, we were pleasantly surprised and impressed. At this introduction, the new black, red and chrome mountain sled was all Polaris said it would be, the Vertical Escape delivered the promises and gave more. Well, through the Vertical Escape (Vertical Edge chassis) years, Polaris magnified its good reputation as a smart mountain snowmobile builder; its mountain line was exceptional. The next surprise from Polaris was also at McCall when the 2005 900 RMK was handed to us for a springtime (March) evaluation. Our surprise was more shock and confusion, as in, “What the…?” With blank-face stares, we knew Polaris departed from its roots. That following fall, when snow settled on the Rockies, in a matter of weeks, the new 900 RMK burned Polaris’ good reputation to ashes. Polaris paid deeply. Surprise number three – the 2007 Raw chassis 700 RMK Dragon. Polaris began its rebirth. The Raw chassis Dragon concept for the IQ-line continued. When Polaris introduced its new Cleanfire Injected 800 Twin in 2008, it signaled that Polaris was back. The sled was lighter than the 900. It did not vibrate. Polaris customers were happy. Times were good again at camp Polaris. Still, the IQ RMK line, including the Dragon, had one small drawback — weight. In a world where light weight makes a mountain snowmobile king, Polaris had to relinquish to the lighter Summits and Cat Ms. Even so, the 800 IQ RMK and RMK Dragon were sweet handling mountain snowmobiles capable of performing technical maneuvers with finesse — sweet balance was key. We found the RMK Dragon to be as nimble as Cat’s M8. The IQ-chassis RMK and RMK Dragon were feather light through the handlebars, smartly balanced, and were easy to flip, flick and toss into a hillside, over a mountain, through dense trees and across deep powder. For 2011, Polaris could not sacrifice the IQ RMK’s good reputation for a bad one, as it once did moving from the Vertical Edge chassis to the IQ RMK chassis. As Polaris learned once before, that would be a costly mistake. Surprise number four – the 800 Pro-Ride RMK. This is the best mountain sled Polaris has built to date. It has excited the Polaris RMK faithful just as the Vertical Escape/Edge did when it made its debut. In our humble opinion, the 2011 Polaris 800 Pro-RMK 155 is, from the Snowmobile.com Mountain Team, the Best Mountain Snowmobile of this season. 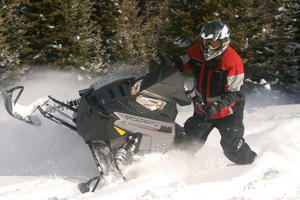 (For a quick Pro-Ride RMK backgrounder, read Jerry Bassett’s 2011Polaris 800 Pro-RMK Preview. Now, let’s get down to business. The 2011 Polaris RMK just might take you places that are beyond your skill level, so proceed with caution. The heart and lungs to the 2011 RMK is the Liberty 795cc 2-stroke, liquid-cooled, Cleanfire fuel injected (CFI) Twin cylinder motor rated at 150-plus horsepower. Mated to the motor is the Polaris P-85 primary clutch with a Team LWT driven. This clutch and motor combo worked well in the IQ Dragon 800 and is masterfully fine for the Pro-Ride RMK line. However, to the customer’s benefit, nice changes were made to the CFI 800 Twin that improves longevity. Polaris knew it needed to reduce weight and rotating mass in order to compete against the light, powerful and nimble Cat M8. Also, the Pro-Ride RMK had to compete against a refined 2011 Summit, which too is light, and uses a one-inch wider track — 16-inches. Deep-powder flotation for the 2011 Summit is exceptional with its new non-ported lightweight PowderMax track. So, the RMK engineers created a stronger and more rigid RMK that is approximately 40-pounds lighter than the IQ RMK. While making the RMK lighter, the RMK project team also created a chassis that resists twisting. It does not flex under load and torque. While creating a lighter RMK, Polaris’ project team set to make a stronger and more rigid RMK. The completely redesigned silencer dropped 7 lbs from the old design. Polaris engineers knew when it came time to retire the IQ RMK 800 it had to be replaced with an RMK that was above the bar. Prior to producing the Pro-Ride RMK, the RMK project team demanded every nut, bolt, wire, and clamp reapply for its job. If the part failed in its interview, it was fired, or replaced with a lighter and more durable, component. Polaris sought to reduce the RMK’s profile by making the Pro-Ride RMK narrower than the IQ. The RMK is Rush-like in looks and appeal with side panels perfectly suited for technical sidehilling. Today’s technical mountain rider demands a sled that rolls into a hill without lifting the track from the snow. Side panels on the Pro-Ride RMK are smooth, flat and do not extend beyond the width of its runningboards. The result is clean fluid lines that appear seamless from front to rear bumper. Some may argue that the RMK runningboards are too narrow, but in this case, the Pro-Ride RMK’s boards are perfect to maintain that narrow profile. Our choice is wicked sidehilling and sharp divots without track lift, rather than increased runningboard real estate. Now, the Pro-Ride RMK has a laydown steering post, which we protested until we tested it. We were silenced. The steering post, with its series of 90-degree angles, delivers three niceties: flat handlebar swing, a low hung motor, and reduced weight. We appreciate that Polaris had this is mind. When Polaris set out to build the Pro-Ride RMK, it took lessons learned from the 900 RMK by keeping that which was good from the model it replaced, the IQ RMK. The RMK project staff carried over to the Pro-Ride RMK successful engineering that made the 800 IQ RMK and RMK Dragon exceptional mountain sleds. So to nail down the specifics, we turned to Lyle Dahlgren, senior development technician, to answer all questions. 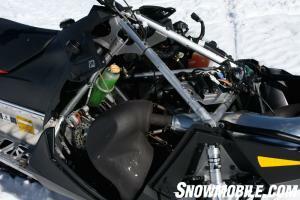 Snowmobile.com: How much lower is the engine in the Pro-Ride RMK chassis, over that of the IQ chassis 800 Dragon? Dahlgren: About 0.75 of an inch. Snowmobile.com: What percentage is IQ and what percentage is Rush? Where are distributions? In other words, is the Pro-Ride RMK, from bulkhead back, the same as last year’s Dragon? Dahlgren: There are basically no IQ parts on the Pro-Ride RMK. The bulkhead castings, chaincase, engine and mounting, side panels and hood are shared between the Rush and the RMK. Most of the other parts are Pro-Ride RMK specific. 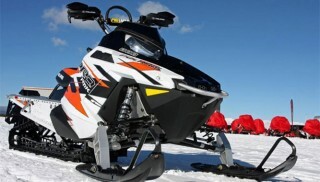 Snowmobile.com: What changes were made to the 800 CFI motor for 2011? Dahlgren: The 800 Cleanfire was refined for model year 2011 (MY-2011). Primary benefits are improved mid-range performance and cleaner emissions. New components include: exhaust system and resonator, fuel injectors, fuel rail, engine management system, cylinders, pistons and linked oil pump. Snowmobile.com: How is the Pro-Ride RMK front end different over the trail and ditch banger Rush? What front suspension geometric changes were made to make the Pro-Ride RMK adept for sidehilling and boondocking? Dahlgren: The geometry of the Pro-Ride RMK front suspension is similar to the IQ RMK. The control arms are nearly identical with the exception of being metric. The new extruded spindle is the major difference, with changes to steering arm length and ski offset to lighten steering effort. The Pro-Ride RMK front suspension is also narrower than the Rush; it is also adjustable to 39”-40”-41” as the Model Year 2010 IQ RMK. Some of the plastic (side panels) was narrowed in key areas to help with sidehilling and working through the tight trees. 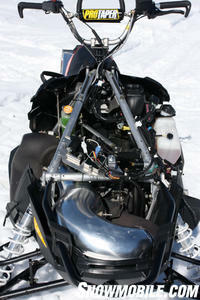 Snowmobile.com: Where was the greatest weight savings realized? Dahlgren: The weight was saved everywhere. There are examples of ounces, pounds, and multiple pounds in many areas; however, the biggest reductions came in the bulkhead design and the rear suspension. The over-structure that Polaris used on the RMK is said to have 300% more torsional rigidity. Snowmobile.com: With the severe loss in weight, how did (where did?) 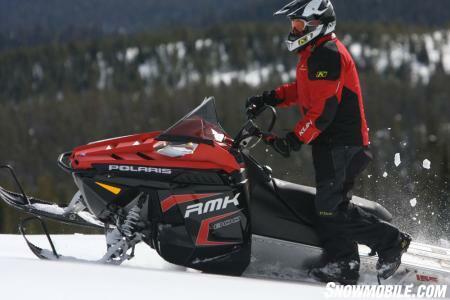 Polaris makes the Pro-Ride RMK stronger? Dahlgren: The cast clip design, tubular overstructure and overstructure casting added about 300% to the torsional rigidity of the vehicle. Snowmobile.com: How is the rear skid different from the Dragon’s? And why the changes from the Dragon’s rear skid to the Pro-Ride RMK — benefits? Dahlgren: Reduced weight, better performance ride, and better snowmobility characteristics. Snowmobile.com: How is the 155 different from the 163? Dahlgren: The 163 is, obviously longer, and has tipped-up rails, just as the IQ RMK Dragon 163 did. This makes the vehicle turn sharper. The 155 has flat rails, as it already carves quite nice when turning right or left. Snowmobile.com: What is the difference between the Standard RMK’s rear skid, to the Pro-RMK’s to the Assault’s? Dahlgren: Shocks, dampening and springs. The Standard RMK has Ryde FX, the Pro RMK has Walker Evans, and the RMK Assault has Walker Evans with remote reservoir needle shocks. The Pro-Ride RMK coil over rear suspension, like the suspension it replaced on the IQ, is well tamed through the bumps, and allows the vehicle to handle deep powder, and mountain ascents and descents with ease and confidence. As mentioned by Dahlgren, this is where the greatest weight savings was realized. For 2011, there are three models: RMK, Pro-RMK and RMK Assault. All use the 800 CFI motor; Series 5.1 track that is 15-inches wide with 2.4-inch lugs; Gripper skis; P-85 drive clutch with TEAM LWT driven; front suspension is PRO-RIDE RMK Adjustable; rear suspension is RMK Coil Over; digital multi-function display instrument pod; RMK Freestyle seat; handlebar hooks; hollow jackshaft; carbon fiber rear bumper, and electronic reverse. Here are the specifics for each. RMK — Good looking, only a 155 (15-inches wide with 2.4-inch lugs); Ryde FX shocks up front and on the rear suspension’s front rails with Ryde AFX shock on the rear suspension’s rear rails; fixed post 89mm riser handlebar; RMK hydraulic brake system; and estimated 440 pounds dry weight. Suggested MSRP is US$10,999.00. Pro-RMK — Track lengths 155 and 163 (15-inches wide with 2.4-inch lugs); Pro-Taper handlebars, Walker Evans shocks all around; lightweight Cyclone brake rotor and caliper; 431 pounds dry weight (155), 437 pounds dry weight (163). Suggested MSRP is US$11,599.00 (155) and US$11,899.00 (163). RMK Assault — 155 only; 15-inch wide competition track with 2.125-inch paddles; Walker Evans Needle shocks on front suspension and rear suspension’s rear rail; Walker Evans Coil on rear suspension front rail; lightweight brake rotor and caliper; hollow jackshaft; carbon fiber rear bumper; lightweight Cyclone brake rotor and caliper; 446 pounds estimated dry weight. Suggested MSRP is US$11,999.00. The new 2011 Polaris Assault Switchback in optional orange. The Assault’s nine-pound greater weight versus the RMK Pro 155 lies with its heavier track and heavier shocks. The Assault’s purpose, like Ski-Doo’s Freeride and Cat’s HCR is hard hits, competition hillclimbing, drops and freeriding in the boonies. Its wider and adjustable ski-stance, 41.5-inches to 43.5-inches, gives it greater stability for competition hillclimbing. However, if chasing an RMK or Pro-RMK (or Summit or M8), it will struggle a bit in ultra-deep powder as its stiffer and lesser-height track will blow out the snow, and its wider stance will hinder it when snaking through densely placed trees. The RMK and Pro-RMK’s softer track, taller lugs, and narrower ski stance (39-inches to 41-inches adjustable) allow these rides to be the powder hounds the engineers designed them to be. Back for 2011 is the ProTaper aluminum handlebar. The hand-warmer controls are off the handlebar down by the gas cap. The 2011 RMK ergos are human-engineered to marry rider and snowmobile to create a team of one. The tall and narrow seat allows easy transitioning from sitting to standing. The handlebars fit well into our hands. The Pro Taper handlebars on the Pro-RMK and Assault are spot on comfortable. Yet, some argue the Pro Taper bars are too wide, touching the driver’s rib cage when standing and when fully swung right or left. We did not experience this, but a few early Polaris guest riders did. There is one complaint we have against the Pro-Ride RMK line, no storage. To carry supplies, the RMK owner must purchase a storage bag that mounts under the seat posts at the seat’s rear end. Yet, this Polaris-designed bag is nice looking and compliments the RMK well. Snowmobile’s contributions to Polaris’ overall revenue are smaller than it once was, but it is the product that made Polaris the manufacturing giant it is. Polaris is synonymous with snowmobiling. Likewise, RMK (born from SKS) is synonymous with mountain riding. The Pro-Ride RMK will cement this once again for Polaris. The Pro-Ride RMK represents a vast investment for Polaris, especially in a down economy where fuel is over $3.00 a gallon, unemployment is high, home values are in the cesspool, and snow depths ebb and flow from year-to-year. Is the Pro-Ride RMK a Cat M8 killer and 2011 Summit stomper? We don’t know. But we can say that model year 2011 enjoys the best 800 mountain class to date with the Pro-Ride RMK establishing itself as the new standard. I was skeptical about the new RMK, concerned that it would not have good sidehilling capabilities. Leaving the staging area on hard frozen terrain, I did a little counter steer, a ski popped up and the RMK easily hold an edge (the 90-degree angles on the steering post, allowed the RMK’s handlebars to rotate flat, which in turn, allowed simple leverage). I learned long ago that if I can easily glide down a trail on one ski, the snowmobile will be great in the trees and when ripping a sidehill cut. The mid-range pull of the 800 is greatly improved, but still not as impressive as the M8 with its H.O. motor. I think Polaris did a great job incorporating elements of the Rush into the new Pro-Ride RMK, but yet different to work in the mountains as a mountain sled should work. The Pro-Ride RMK felt light and nimble in the trees, and on a sidehill, I could not pull the track out of the snow. We climbed steep mountains higher on a stock 2011 RMK 800 than we could on a turbocharged 800 IQ. The Pro-Ride RMK is easy to ride with a minimal learning curve. I can honestly say this is the most radical change to mountain snowmobiling since Cat introduced its 2005 M7. The Pro-Ride RMK is going to change mountain snowmobiling, moving it aggressively forward. What many have thought impossible will quickly become the norm. 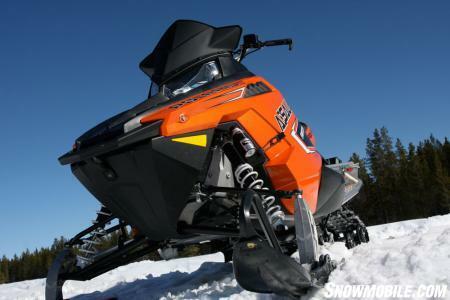 Polaris has raised the bar for mountain snowmobiles. It will be interesting to watch the other OEMs; can they rise to the challenge and try to build an even better snowmobile, or just try to weather the storm by making a few improvements here and there to their old chassis? Also, it will be interesting to watch in season-2011 how the public accepts the Pro-Ride RMK, and what the other OEMs will develop to trump it. It is clear with its marketing and drive that Polaris is serious about its mountain sled program – it plans on thriving. I’ve noticed in the past few years many loyal Polaris riders jumped ship for lighter mountain sleds. Now, Polaris has the goods to welcome back those riders who have a soft spot for the RMK. Matt and Jake covered the tech stuff, so I’ll keep my comments short and to the point. After a personal tech session with Dahlgren I liked what I learned about the Pro-Ride RMK. After my first ride, I liked the Pro-Ride RMK even more. By the end of the evaluation week, the Pro-Ride RMK and I became good friends. Several weeks later after an extreme ride with powder guru Chris Burandt, my appreciation for the Pro-Ride RMK increased. 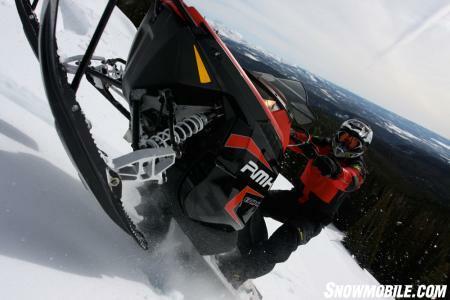 The 2011 Pro-RMK is what a mountain sled should be.